This week, police in China's Henan province spotted a peculiar delivery truck traveling down the Jinggang'ao Highway. The truck was quite noticable because it had a cardboard windshield. The windshield of the truck was broken in an accident a few days ago, but the driver "didn't have time" to fix it because of his delivery schedule. He traveled 400 miles with the cardboard in place. Mr. Li, the driver, told police, "When there were a lot of vehicles I would drive with my head out of the window... I would drive like that until my neck got too sore and numb, when I would drive by looking through the little holes in the cardboard. 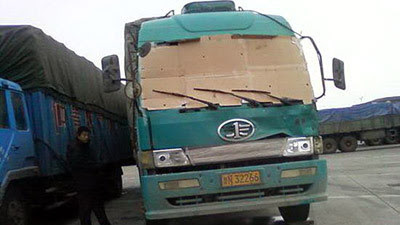 (see picture)"
To make driving even more difficult, the weather has been freezing over the past few days... which undoubtedly encouraged the nearly-frozen Mr. Li to keep his head inside the truck as much as possible. Police made sure that Li got his windshield fixed before continuing his deliveries.